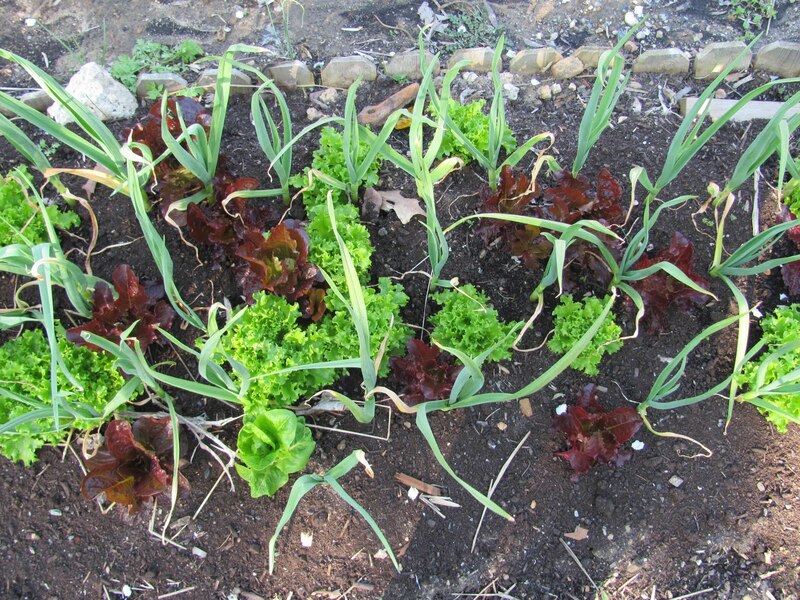 In early Spring I wrote with joy about the lovely salad greens growing amongst my garlic. See photo from April, on right. It seems so efficient and looks great. But I did notice that the garlic plants themselves did not look as strong as my other bed where I had only garlic. So I removed some of the salad plants to ensure that there would be plenty of room for the garlic. 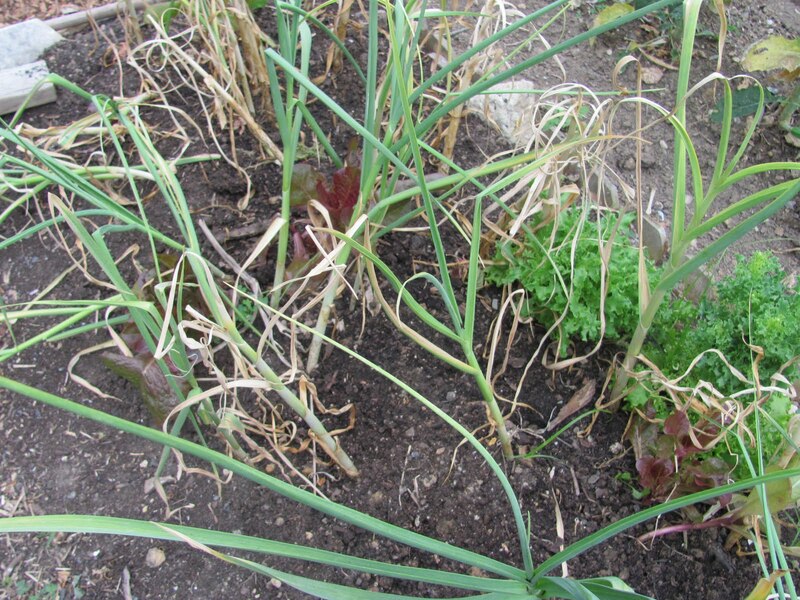 By early June I noticed that the garlic plants with salad greens were visibly weak relative to the garlic plants that were growing by themselves, without greens, in a different bed. See pictures of both beds–both were planted on the same day last Fall. Harvest time was early, because the weaker plans were lying dead, effectively finished. I harvested both batches at the same time out of curiosity, a few days ago. The difference in garlic size is significant. 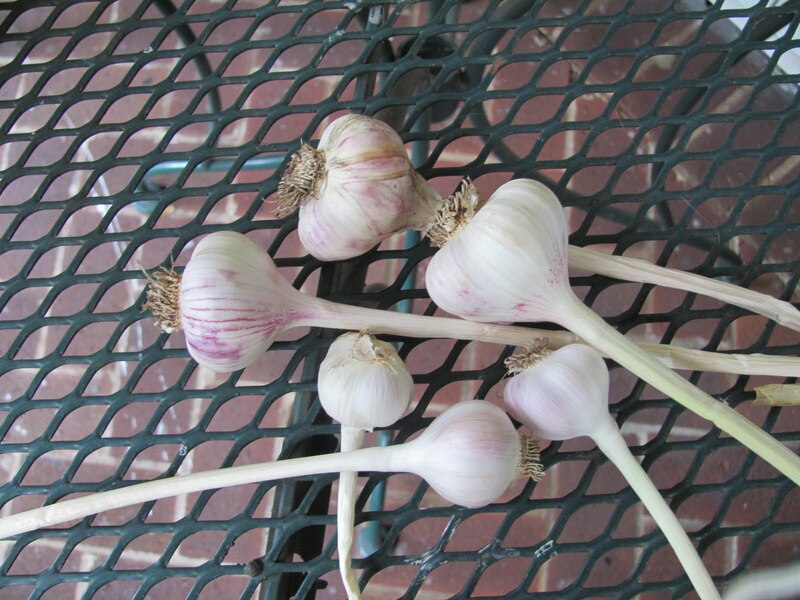 The three smaller garlics in the picture are from the plants that grew alongside the salad greens, and the three larger ones are garlic that grew independently, without other plants. I believe the salad greens took up all the water because they are so water-intensive. Both sites are comparable in soil and sun exposure and got about the same watering, although I may have used more water on the bed with the greens. See below for difference in garlic size. If anyone has evidence to the contrary, I would like to know, as the idea of growing the salad greens as companions to the garlic is very appealing visually and practically.